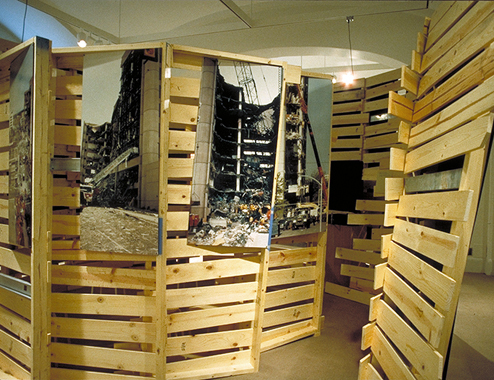 "We'll Be Back" was an exhibition commissioned by the NEA to examine the future of Oklahoma City after the 1995 bombing. LBA curated the exhibition, developed the content, and designed the display. To do so, LBA worked with the FBI to recover artifacts from the original crime scene. These artifacts were used to express how the city endured difficult times to emerge even stronger. A 10' x 12' model of Oklahoma City was salvaged from the 1960's. Built by IM Pei, it proposed a radical urban restructuring. In addition to footage from the resulting devastation of the bombing, several proposals for reconstruction were displayed.